Leaders are found in many settings. Ministers, corporate managers, spouses, parents, and leaders in all areas of life need motivators to keep them focused and growing in their leadership. 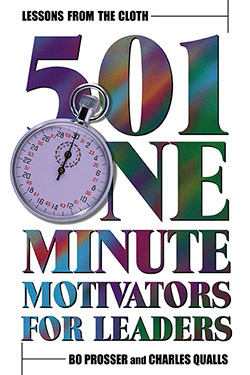 Lessons from the Cloth: 501 One-Minute Motivators for Leaders will inspire you to keep growing in your leadership career. Among a multitude of themes, the book touches on communication, power, trust, and balance as keys to progress. These elements of working with others do not come naturally to many of us. It takes work to be at our best. In today's society, time has become more and more valuable. These one-minute motivators allow readers to pick up the book and immediately begin improving some aspect of their leadership style. All of the motivators address our life's journey and the hope of finding balance and direction. Bo Prosser is the Coordinator for Missional Congregations with the Cooperative Baptist Fellowship in Atlanta, Georgia. Prior to that he served local churches in Kentucky, Georgia, and North Carolina. 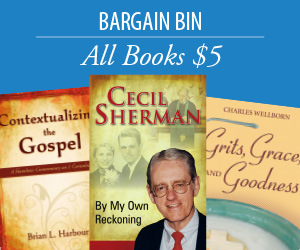 He has authored and co-authored six books with Smyth & Helwys. He is a popular speaker and trainer in creativity and humor. Charles Qualls is Associate Pastor at Second-Ponce de Leon Baptist Church in Atlanta, Georgia. Prior to this, he served churches in North Carolina and Georgia. His ministry has been in the areas of adult Christian education and pastoral support groups. He is the author or co-author of six other titles for Smyth & Helwys.